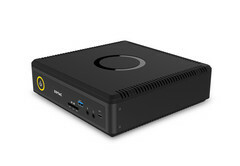 Zotac has announced the what it is calling the world’s first mini workstation powered by Nvidia Quadro graphics. The new Q Series Mini Workstation PCs are available in three major configurations and in two distinct designs, both with the small footprints for which Zotac is known. 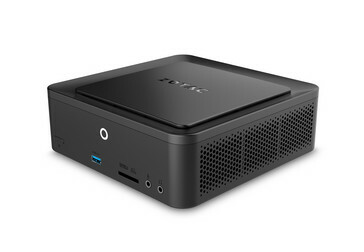 The Q Series Mini PCs give creatives the power to undertake tasks like industrial design, advanced special effects and complex scientific visualisation. The entry-level Zotac QK5P1000 is powered by 7th-generation Intel Core dual-core i5-7200U with support for DRR4 RAM up to 32GB. It is fitted with an Nvidia Quadro P1000 GPU with 4 GB of GDDR5 RAM that incorporates 640 CUDA cores based on the Pascal architecture. Its support for graphics APIs includes Shader Model 5.1, Open GL 4.5, DirecX 12.0 and Vulkan 1.0 while its support for compute APIs includes CUDA, DirectCompute and OpenCL. Storage options include one 2.5-inch SATA III 6Gbps drive and an M.2 SSD at 6Gbps as well. The mid-range QK7P3000 is powered by a 7th-generation Intel quad-core i7-7700T with support for DDR4 RAM up to 32GB. It is fitted with an Nvidia Quadro P3000 GPU with 6 GB of GDDR5 RAM that incorporates 1280 CUDA cores, also from the Pascal family. It also offers support for the same APIs as the P1000, but is considerably more powerful with double the shader count. Storage options include one 2.5-inch SATA III 6Gbps drive and the option for an M.2 NVME SSD. The high-end QK7P5000 is powered by the same 7th-generation Intel quad-core i7 chip as the QKP3000. It differs, as you may have already guessed, by offering a more powerful Nvidia Quadro P5000 GPU with 16 GB of GDDR5 RAM and incorporates 2560 CUDA cores. API support is the same as the other three, but doubles the shader count once again making it suitable for most intensive graphically heavy tasks. Storage options include one 2.5-inch SATA III 6Gbps drive and an M.2 NVME SSD. Pricing and availability has yet to be announced for these Windows 10 machines, but all three models are live on Zotac’s website. The Zotac QK5P1000 is the entry-level model. The mid- and high-end Zotac QK7P3000/QK7P5000 feature the same design.